It is an 8th grade science class. Students are learning the concepts of Force and Pressure. The lesson starts off with activities, involving them in a game —a tug of war or arm wrestling each other. Throughout the lesson, there are several images and videos that demonstrate the concepts. Their homework for the day is to help at home in preparing rotis, which would involve activities such as separating the hardened dough, rolling it etc — all connected to the concepts that they had studied earlier that day. This is how a lesson looks like, in a class that uses the application developed by the Bengaluru-based organisation Meghashala (School in the Cloud). Lesson plans for Grades 1 to 8 for the subjects English, Math, Social Studies and Science, which are in sync with the Karnataka State syllabus, are developed by the organization and made available through their app on Google Store since 2017. “We ensure that our lessons cater to the needs of the students at different learning levels, and of different learning styles. Our lessons include a lot of activities, images,videos and they are always related to real life experiences,” says Sharvari Tilloo, Product Lead with Meghshala. Mallikarjuniah teaches Mathematics, English and Science to grades 5th, 6th and 7th and regularly uses the application with the tablet and projector provided by Meghshala to his school GPHS Kodathi in Bengaluru. He observes how earlier he had found it extremely challenging to teach concepts such as elements and compounds, and now through the app, through visuals and activities, students are able to have a deeper understanding of concepts. His views are echoed by Suneetha T, who teaches at GPHS Chikkadevasandra in Bengaluru. She mentions how student participation and engagement in class have increased since she started using the app two years ago. She mentions how students are able to navigate the app on their own on the tablet and revise chapters in the rare occasions where she has to step out of class to do administrative work. The success that she has found upon using the lesson plans provided by the application has encouraged three other teachers in the school to use the application. Currently they have formed a time table, based on which they access the tablet and the projector. While there have been several interventions in primary and elementary education in the past two decades such as the District Primary Education Program (DPEP) in the 1990s, or the Sarva Shiksha Abhiyan (SSA) scheme in the early 2000s, most of these interventions have focused on increasing enrollment and ensuring adequate infrastructure in schools; not on quality teaching and learning outcomes. The abysmal learning levels of the students in both government and private schools are evident from the outcomes of the yearly Annual Status of Education Report since 2005. There is a direct correlation between quality of teaching and student learning levels. Student learning levels are bound to be low if government school teachers are constantly disheartened and demotivated. A significant number of teachers working in government schools face several challenges (varying in degree from state to state) including having to teach in schools that are understaffed where they would have to combine multiple sections/classes, or facilitate learning for students who are at varied grade levels in the same class. Most of the trainings that they receive do not factor in these realities. There is always constant pressure from the administration to ensure that the syllabus is complete; which takes priority over learning outcomes. The administration seems to value provision of requested information on time, proper record keeping of attendance / midday meals etc, more than learning outcomes. An earlier article in this series points to poor quality training and curriculum at Teacher Education Institutions, teachers having to spend a large portion of their time on administrative work, promotions being based on tenure and not performance, as some of the reasons for poor quality of government schooling in Bengaluru. Meghshala believes that the most effective way to transform the ailing education system in the country is by focusing on the heart of the education system – the teachers, by empowering them to lead enlightened classrooms. “I have been grappling for over a decade with questions of and the need to provide equitable education to all. The sheer number of students in the country that were not receiving quality education was overwhelming, and it wasn’t until improvements in technology, that I could think of a solution that could start addressing these concerns,” says Jyoti Thyagarajan, an educator with over 40 years of experience across the globe, who co-founded Meghshala in 2014. Once the first versions of the app was designed, thirty government schools in Bengaluru were selected as sandbox or test schools, and a set of one laptop/ tablet and a projector was provided to each school. The app was modified based on the feedback provided by the teachers, and was released in 2017 on Google Play Store. 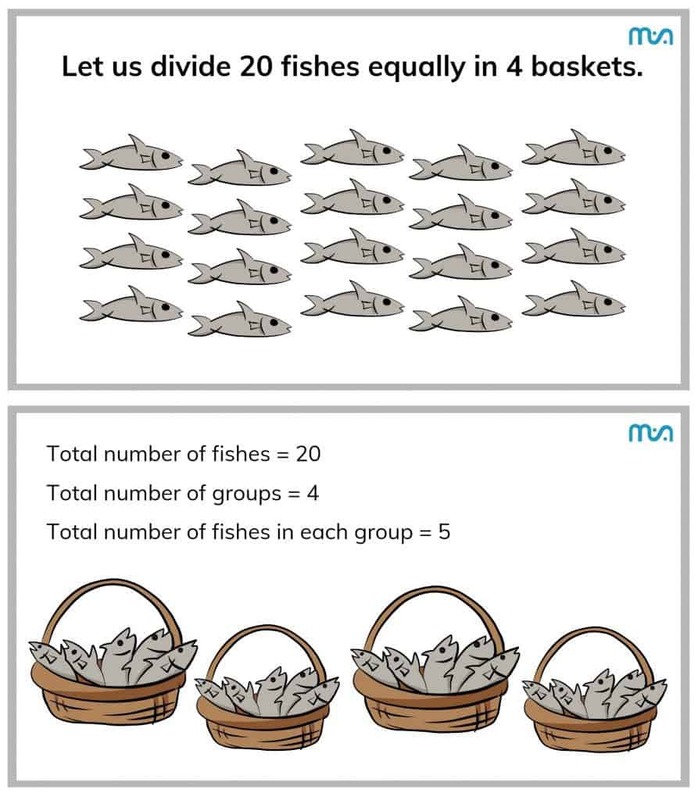 Lessons of division made easy by Meghshala app. Currently Meghashala says they support 180 schools in 13 districts of Karnataka. 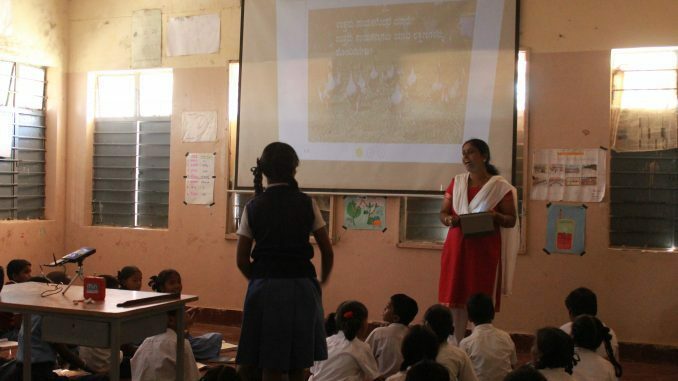 98 schools located in Bengaluru are provided with a tablet and a projector. One teacher is selected as a Meghshala Fellow from the school, who receives technical support from the Meghshala team, and continues to provide feedback about the tools. Manjunath H M, Implementation Lead at Meghshala says that in several schools the Fellow having found the application to be beneficial has encouraged other teachers to use them as well. And in such schools time tables have been created based on which teachers access the tablet and projector. There have been instances where the school leader has approached corporate organizations to donate projectors, so that more teachers can use the app simultaneously. Manjunath points to how the response among teachers and schools have been very varied across districts and blocks in Karnataka. In the southern blocks of Bengaluru, the responses from teachers have been positive, whereas the responses from the northern blocks haven’t been to that extent. The app is able to capture the teacher usage information, and they are still in the process of analysing the data to understand why certain schools have higher usage than others. Meghshala plans to develop 10 models schools in the various blocks across 13 districts where they work. Through the meetings called by the Block Education Officer (BEO) who have constantly supported them, they are reaching out to a large number of teachers. During these meetings, the teachers are introduced to the app, are encouraged to download the app on to their phones and use them in class. Manjunath points to how teachers from the blocks and districts where they don’t have a presence are unable to use the app, as they are discouraged by higher authorities from using smartphones in the class. Meghashala is currently in the process of signing a Memorandum of Understanding (MOU) with the Karnataka State Government, which would allow them to conduct their training and introduce the app to Master Trainers at every District Institute of Education and Training (DIET) in Karnataka. The master trainers would then introduce the app to all the teachers during the training at the Block level. The reach would be much higher where all teachers in the state are familiarised with the app and its usage, compared to Meghashala’s current interventions at the block level. At present, based on feedback the app is being revamped, redeveloped and a newer version will be available on Google Play Store by end of November 2018. Lesson plans in Hindi and English based on the NCERT (National Council of Educational Research and Training) syllabus will be an addition to the upcoming version of the app.This would enable and encourage a lot more teachers across the country, who follow the NCERT syllabus to use the application. There are other initiatives that aim to support teachers such as The teacher App that currently provides resources to teachers in Hindi through interactive videos on core concepts in Pedagogy, Science, Math and Language. Teachers of India, an initiative by Azim Premji Foundation, provides resources in Hindi, Kannada, Tamil, Telugu and English for teacher educators, teachers and others working in the field of education. The Ministry of Human Resource Development( MHRD) has in the past year launched a digital initiative called Diksha that provides online resources for teachers in several languages, and is available as app. The content partners for this initiative include Meghshala, The teacher App, Teacher of India, Tata Institute of Social Science and several other organisations. Several teachers from Bengaluru have spoken about the usefulness of the lesson plans in the app and Meghshala through its advocacy is in the process of reaching out to many more teachers in Karnataka and India. While Meghshala provides the resource for school teachers to facilitate learning of concepts to children better at different learning levels and different learning styles, there is the need for several systemic changes, in order for teachers to truly benefit from it and other such initiatives. Teachers will only be able to perform average work at best if they have to manage several classes/sections due to shortage of teachers in their school. There will be a shift in teachers taking initiatives to ensure student learning if their work and performance are recognised. As mentioned above quality education and learning outcomes aren’t prioritised. There needs to be a move towards this, and away from merely completion of syllabus and administrative tasks. This is the third part of the series on Quality of education in government schools. What ails government schools in Bengaluru? Bangalore University has decided to do away with the age-old three-year BSc, BCom, BA degrees, and introduce four-year BS and one-year MS courses. How will this impact students?